How many of you could recite, word for word, a definition you learned in school? When you first memorized the definition, you could state “inertia is a property of matter”, or “density is mass over volume”. However, you struggled to apply it to a new situation and maybe you were unsure of how to construct a model of what it meant. As an educator, I have examined different approaches to help students build their vocabulary as a way of developing concepts. In the past, I gave students a list of vocabulary words to define using their textbook, or I simply gave them the definition through direct instruction. Even after these "riveting" lessons, their assessments demonstrated they lacked conceptual understanding despite being able to regurgitate a textbook perfect definition. We know there is evidence that the textbook definitions do not help students because textbooks do little to engage students and do not help them use the terms in an authentic way and therefore retain the information1. Additionally, teaching a dictionary definition assumes the definitions are situated in the dictionary, rather in the concept. Students only see the term as a dictionary definition without understanding how the concept developed or the applications of the term. For example, a student defining the Law of Conservation of Mass as “matter is neither created nor destroyed, simply rearranged” might not see its connection to balancing chemical reactions or Avogadro’s Hypothesis. By limiting students’ ability to develop their own definitions, the word itself can be limited to a definition and may not become a fully developed concept2. After I moved to Modeling InstructionTM several years back, I put more emphasis on having students develop their own definitions. The goal was to have students situate their learning in an engaging and authentic activity and apply it to another context. After a paradigm lab or classroom demonstration, my students whiteboarded their data and analysis. Their board often included a particle diagram, a definition, and a symbolic representation. 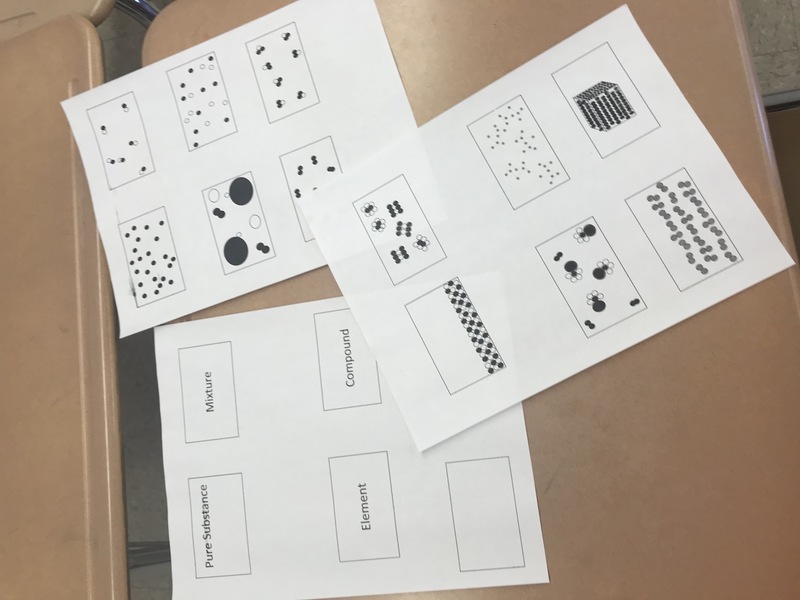 Afterward, in the resulting class discussion, students would come up with a working definition for terms such as volume, density, and pressure. Until this year, I still hadn’t found a way for the students to develop definitions of terms such as pure substances, mixtures, elements, and compounds. The classroom activities, demonstrations, and video clips still had not solidified the terms for my students and they often remained confused at identifying particle diagram models. Textbook definitions might help some students in terms of rote memorization, but did not help them build a mental model of these terms. This time, I decided to have my student try a card sort to address the weakness I observed. This led to the students’ detailed discussions about why they put the diagrams into specific groups. My students then took the previously set aside category cards of Compounds and Elements and resorted all the images (figure 3). I once again circulated and asked questions about their choices, what were similar and what was different. This time, the students had more detailed conversations. My students then divided their whiteboards into four quadrants. In each quadrant they described the characteristics of the different categories and drew particle diagrams to give examples. When they finished, my students stood up in a circle and displayed their whiteboards (figures 4 and 5). The students used their evidence from classroom experiments, demonstrations, and discussions to justify their categories. Even after time within their groups, students still displayed misconceptions. They commonly described a pure substance as “one thing” and affirmed that a compound could never be separated into its components. The term “pure” generated an image of something unadulterated - unique - so to them it meant only having one type of particle. On the other hand, I found students had built clearer mental models about characteristics of mixtures. Therefore, I used their evidence and explanations to guide them in developing strong definition of the term. They discussed how they separated iron filings from sulfur using a magnet and developed procedures to separate sand, salt, and water. They concluded the components of mixtures maintained their own properties and their composition varied. We took their model of mixtures and applied it to compounds. They had seen iron could not be separated from iron sulfide using a magnet indicating a new substance was created and it had different properties than its components. They had also used electrolysis to separate water into hydrogen and oxygen and tested for the different gases. They knew water didn’t make a popping noise with a burning splint and it definitely didn’t burn brighter with a glowing splint. Using this evidence, it seemed more likely that a compound was something new and not merely a mixture of two different substances. If a compound was not a mixture, it needed placement in another category. After the class came to consensus on all four definitions, they wrote them on their paper, drew a particle diagram, and gave an example. 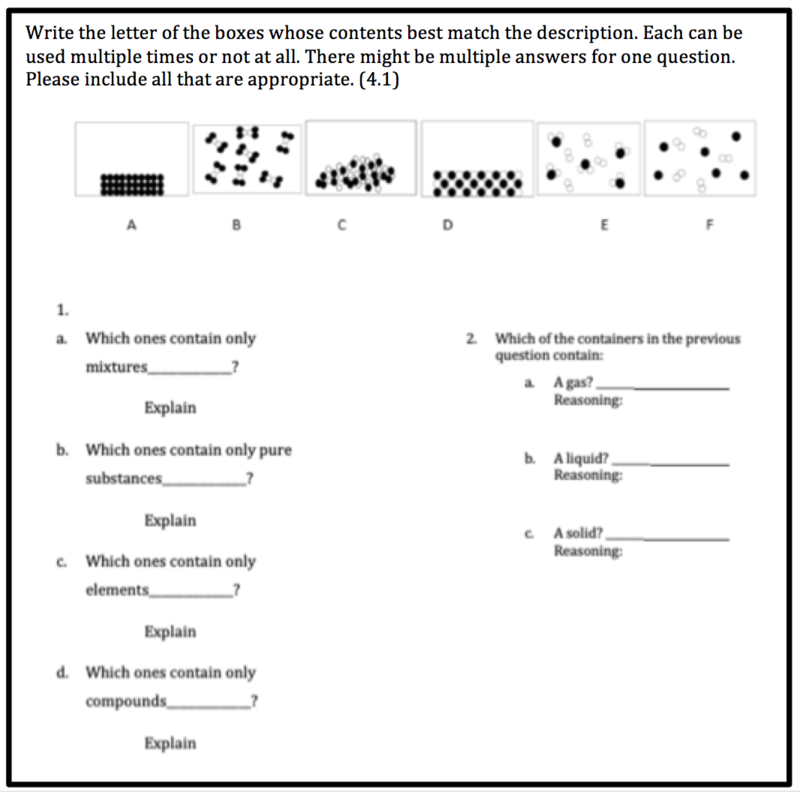 The following assessment question showed a greater number of my students achieved proficiency on this learning objective than they had in previous years (figure 6). 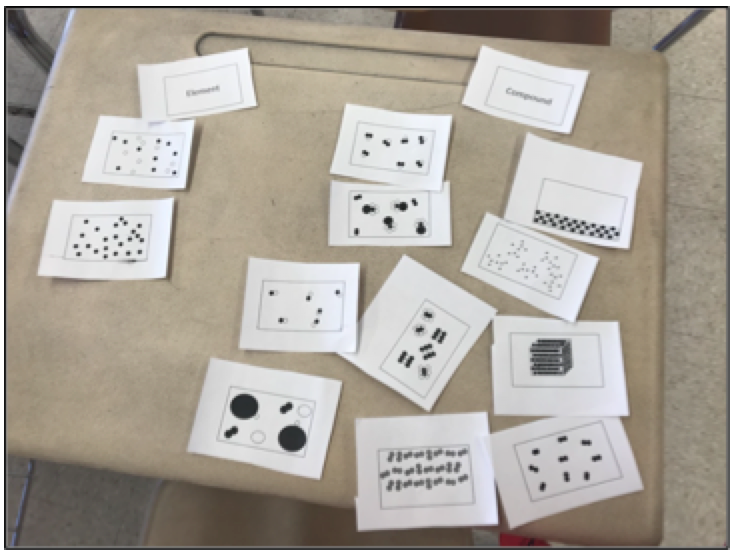 By making my students do the work of developing their own definitions, they situated their learning in the experience of seeing patterns and drawing conclusions. They internalized the terms and constructed strong mental models that they applied to different units. 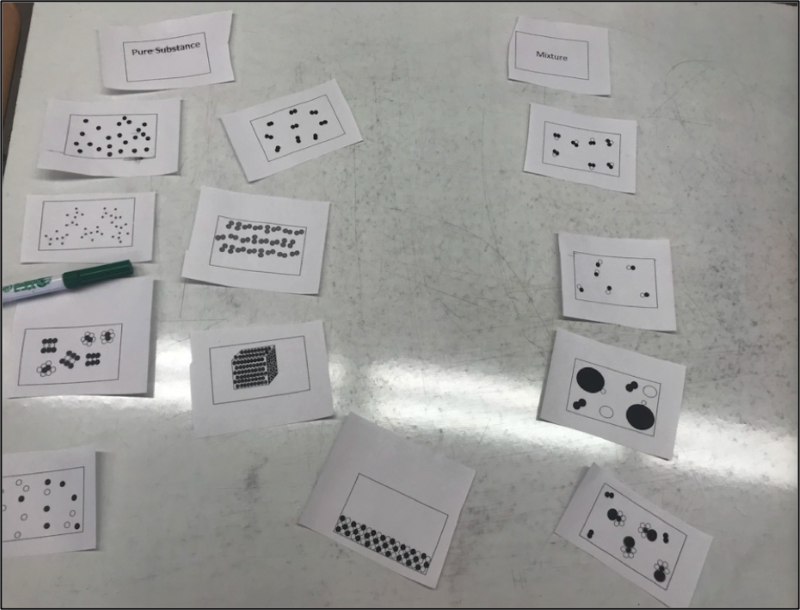 While not every unit can use a card sort, I found this was a quick, engaging, and authentic activity that allowed the students to be placed at the center of their own learning, to develop stronger models, and achieve the proficiency to help them succeed in chemistry. 1. Roth, W.-M.; McGinn, M.K. Review of Educational Research 1998, 68 (1), 35-59. 2. Brown, J. S.; Collins, A.; Duguid, P. Educational Researcher 1988, 18 (1), 39–42. Modeling in 9–12 builds on K–8 and progresses to using, synthesizing, and developing models to predict and show relationships among variables between systems and their components in the natural and designed worlds. Modeling in 9–12 builds on K–8 and progresses to using, synthesizing, and developing models to predict and show relationships among variables between systems and their components in the natural and designed worlds. Use a model to predict the relationships between systems or between components of a system.